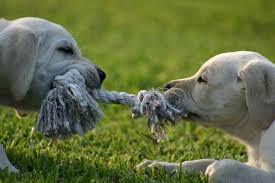 A tug of war may be a fun game if you’re a dog. It’s not so pleasant when life itself is a similar struggle. We all have our difficulties. For me it’s often related to body sensations since watching my body age is not so pleasant. Maybe you get caught in struggles with emotions or thoughts or relationships. That’s easy to visualize. It’s not so easy to do. The key is self compassion, kindness and curiosity. What would it mean to “let go of the rope” in this situation? The problem is not that the mind was off, it’s the reaction to it that creates the problem. So when you notice your mind is wandering, is it possible to just notice it and come back to the breath? When judgmental thoughts come up, is it possible to notice the thoughts and just come back to the breath? Every time you practice in this way, you are practicing kindness and self compassion. It can also be helpful to bring curiosity to the moment. For instance, if you notice judgmental thoughts, you might explore: how does that show up in the body? What is that experience like at the level of physical sensation? How does that feel a moment at a time, a breath at a time? Just allowing it to be as it is and noticing what’s happening in the moment; exploring textures, patterns and edges while noticing any tensing, bracing or resisting. Instead of trying to make it go away, bringing a gentle, warm, open curiosity. The more you practice this during your formal meditation, the more it will become natural at other moments in everyday life or even as a way to approach life as a whole. To inhabit my body in all its grace and its flaws appears as a gift for the new/mundane bodily territory I’m on in midlife. Aging is the ultimate slow motion loss, inevitable for us all, and yet somehow for me and everyone I know, it’s come as a surprise. You hit a point where it’s no longer incremental, and no longer amenable to cover up. The original dance between order and chaos takes over our bodies inside and out—even with lots of yoga. As I watched my children move through the primal metamorphosis of adolescence, I made a decision to be fascinated rather than terrified. I’m trying to [bring] the same discipline on my reaction to myself on this end of aging’s metamorphosis. Following is a short practice that you can use at any time during the day when you find yourself struggling, reactive or caught up in emotions. It can be done for just a minute when you feel triggered, or for longer periods when you have the time. O Observe thoughts, body sensations and emotions in a kind, receptive, curious way. Directly contact the felt sense of the experience. experiencing more choice about how to respond to life. finding new possibilities opening up. discovering fresh ways of relating with yourself, with loved ones and colleagues. having more feelings of gratitude and greater ease. Observing your experience in this way begins to create a space that softens the harsh edges. Your entire being is not so rallied in resistance. You are learning to “let go of the rope”. Thank you Walter. So glad to hear it resonated for you. Miss Jean once again, for me, you are spot on I’m playing with living within sustainable elastic limits and backing off hardened end points. Makes times for me a bit quieter.